For full and comfortable working with the probe in linuxcnc I wrote the application Probe Screen. In this article, I will share the description and source code. Attention! Measuring operations are very intolerant of incorrect settings. It is strongly recommended to do preliminary tests on loose object that will not damage the probe when unexpected movements. It is recommended to carefully check each setting before measuring the workpiece. If you are already using .axisrc, then only add to your file contents of this .axisrc. Set the probe in the spindle. and for XY about the position indicated by the colored dot on the appropriate button Probe Screen. Fill parameters. 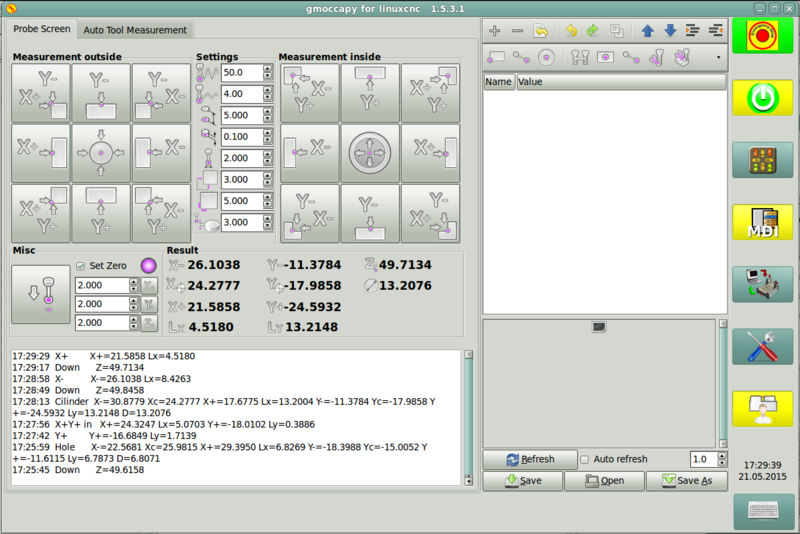 Meaning of the parameters should be clear from the names and pictures (the name pop up when approaching the mouse). If you change the parameters are automatically saved in manualtoolchange.pref . Hit only! the button that corresponds to the position of the probe above the workpiece. For the other buttons - another position above the workpiece. You do not need to expose offsets for tool "Probe", the program desired zero offsets for the current tool makes herself, and G-code works off all in relative coordinates. In fact, you can use the application immediately after the Home. Path measurement hole, edge length should be approximately equal to the radius of the hole measured, xy clearance - inside offset from the walls of the hole. 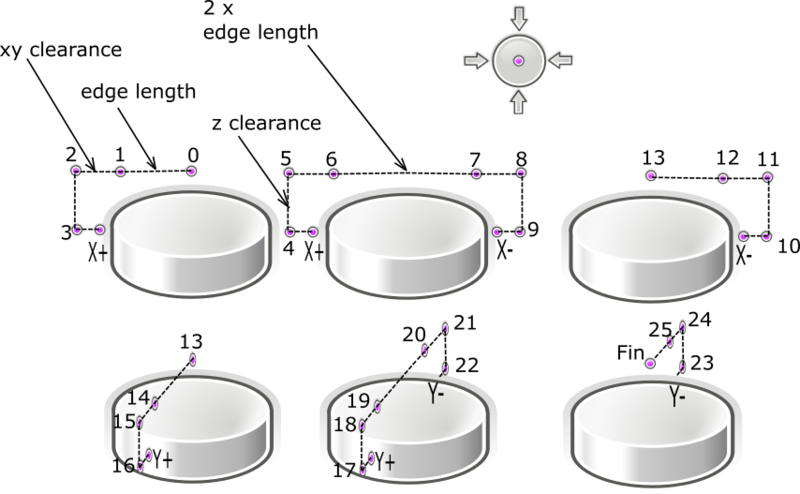 Any of the search ends at XY moving at the desired point (or edge, or corner, or center), Z remains in the original position. P.S. Style of Nick's for Features great decorates Probe Screen. For him, huge gratitude! P.S.S. Sorry for my English. Last edit: 17 Sep 2015 22:02 by verser. The following user(s) said Thank You: Mike_Eitel, BigJohnT, andypugh, Nick, billykid, PKM, RotarySMP, RayJr, nkp, blacksmith99 and 19 other people also said thanks. What is the attached file's proper extension please? I renamed to all the know compressed file extensions but nothing works. Last edit: 13 May 2015 22:55 by mariusl. It was a .rar file. It is looking very promising so far. I have not got it to work on Gmoccapy yet but I can see one very big requirement. 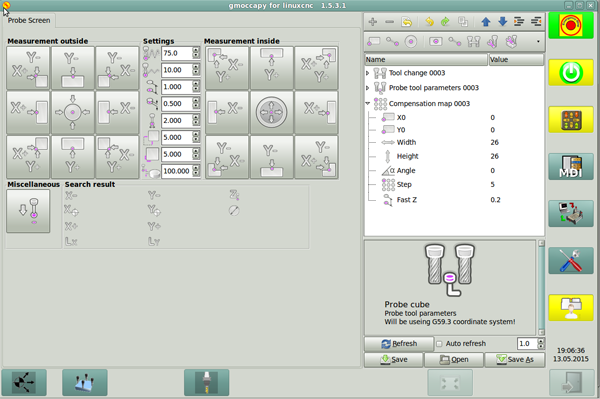 One must have the option to choose an offset (G55 etc) and then choose to set the coordinate system to zero in stead of just making a measurement. 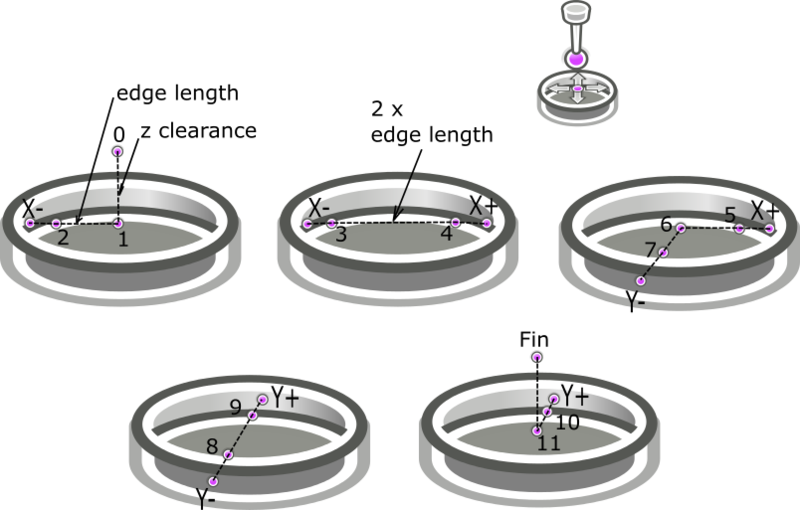 If I probe a hole I would want to set the tool to the middle of the hole and make X and Y both zero. Now one can start doing bolt patterns or mill threading etc. Similarly for a corner or an edge. You would have to have a parameter for the probe tip diameter and then set the probed edge as zero for the axis involved if the option was ticked. 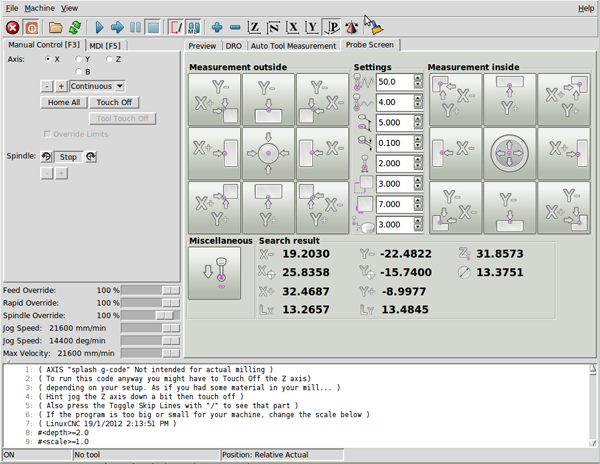 mariusl wrote: One must have the option to choose an offset (G55 etc) and then choose to set the coordinate system to zero in stead of just making a measurement. If I probe a hole I would want to set the tool to the middle of the hole and make X and Y both zero. Now one can start doing bolt patterns or mill threading etc. Similarly for a corner or an edge. You would have to have a parameter for the probe tip diameter and then set the probed edge as zero for the axis involved if the option was ticked. Last edit: 14 May 2015 02:15 by verser. Ah you see I cannot run it yet on Gmoccapy so I did not test anything. Just observations. So for a hole, it will place the probe in the middle of the hole and I can then do a manual offset. How does that work for the edges? mariusl wrote: Ah you see I cannot run it yet on Gmoccapy so I did not test anything. Just observations. I just fixed a bug in the source code. Take, please, the new version. mariusl wrote: How does that work for the edges? In the beginning you need to install the tip of the probe just above the measured corner or edge(as indicated by the colored dot on the appropriate button Probe Screen). Z_clearance sets the depth. Set all parameters. And go . Last edit: 14 May 2015 17:39 by verser. Thanks I uploaded the new software and now it loads. Not tested yet but will do so soon. What is the other piece of software next to you probing stuff on your picture a couple of posts back? Gmoccapy loads with the probing stuff loaded in the usertab but when I run it the system goes to MDI mode and nothing further happens. Is there some other stuff that must be installed or not?